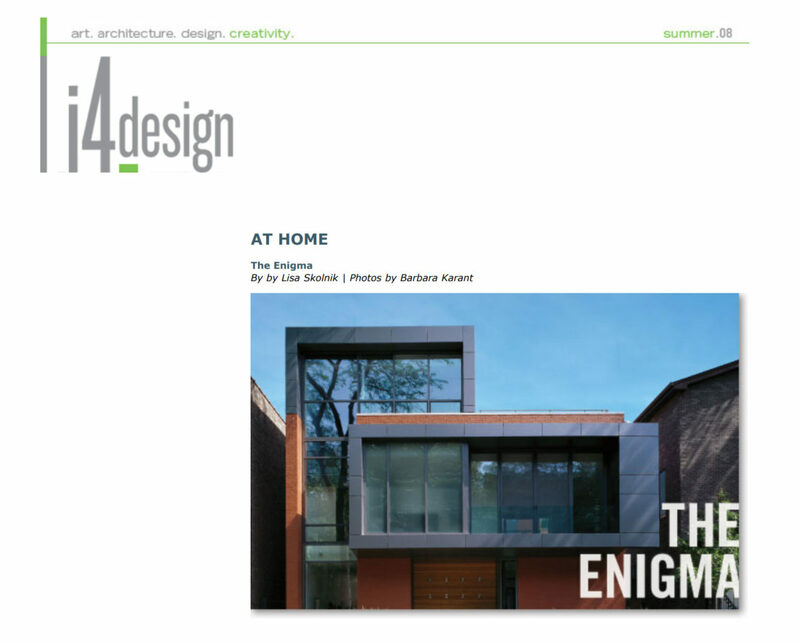 DeStefano + Partners creates an award winning house in Lincoln Park with a hidden personality. All houses have a personality. Some confront the street head on, with crystal clear windows that invite passers-by to peek in and assess their character. Others shirk from it, hunkered down behind fences, set way back on their lots or punctuated with windows deftly designed to obfuscate their depths. And every now and then, a house has a hidden personality. It seems to be one way, when in reality it is not. The Lincoln Park house architect Avi Lothan, a principal in De Stefano + Partners, designed for his family of five is a stunning example of this enigma. The home is a geometrically precise number, which isn’t surprising considering that Lothan’s firm is noted for designing strong, clean-lined high-rises that are long on references to Modernism and short on kitsch. It almost hugs the edges of its 48 by 115 foot lot with a frame formed by two rectangular, glass faced boxes. One rises three-stories high, and the other, a two-story horizontal mass, bisects it and sports an aggressive overhang that pushes a second floor bay within feet of the sidewalk. Thanks to all that glass, the house seems to spill its guts to the street. The foyer, strewn with backpacks and shoes, sports a sleek tri-color cabinet, and overstuffed umbrella stand and a gigantic square bench. An abyss of open space soars three stories above it. In the brazen bay, there are two chairs and a little tabled backed by a rocker and book-packed shelves. To state the obvious, nothing could be more transparent than all that glass. Appearances are deceiving. “The house looks totally transparent, which makes it inviting. It seems to show of everything that’s going on inside. But people usually walk in and are astonished by what’s really there,” says Karen, Avi’s wife. Famous first words, in her lexicon, are “Wow. I had no idea that it would look like this. Literally, that what everyone who walks in here says,” she reports. And for good reason. The foyer is but and antechamber to a dramatic, double-height, 40 foot long living room anchored with a handsome baby grand piano and filled with sleek but cushy contemporary furnishings. It’s edged on one side with glass that overlooks a equally stunning, 40 foot long interior courtyard, and bounded on the other side with a second-story, bookshelf-lined catwalk. And there are plenty of other equally intriguing spaces in the place that one would never surmise from the street. “It’s really private and secluded on the inside,” points out Karen. Beyond the grand salon style living room lies the dining room and kitchen; in front of it, adjacent to the foyer and behind that small silver of brick on the house’s mostly glass, street-side facade, is a spacious home office for two that would inspire envy in any couple with work to do at home-especially given the fact that its back wall is mostly glass and sports a door for instant access to the courtyard. “The house is C-shaped and wraps around the courtyard. But every room has access to the outside,” explains Lothan with justified pride, for this no small design feat in on a tight city lot. Indeed, behind the far end of the C, which hold the kitchen and dining room, is a compact backyard followed by a garage. Both rooms are also punctuated with plenty of glass, allowing the kitchen to open onto the central courtyard and the dining room to access the yard. On the second story, the master suite is in the front of the house and incorporates the space created by the jutting overhang. Though it looks like one room from the street, it’s actually a bedroom edged with a spacious balcony. With an entire wall of glass on the bedroom, and waist-high glass panels edging the outdoor space, all the furniture seems to be floating in one giant bedroom. One the back edge of this level, there’s a family room with two decks-one a trim balcony that overlooks the courtyard, and the other a room-sized deck that tops the two-car garage. A third story looks like it is part of the soaring living from the front of the house, but it is actually a contained floor that holds three bedrooms and connects to two more decks, one at each end of the house over the master suite in front and garage in the back. By intent, the bedrooms are spacious but not huge, and share one bathroom. “Most new homes have over-the-top bedroom suites, but we reversed the formula and have over-the-top public spaces. We didn’t want the kids to live in their rooms…we wanted them to spend time in the public areas with us, “explains Lothan. This strategy, along with the courtyard that draws everyone to the center of the home, makes the house warm and nurturing despite its wide-open spaces and lean physique. “It lives like a family home. The kids really spend their time playing games in the living room or courtyard,” points out Lothan, who sometimes isn’t thrilled with the consequences. “To my my consternation, there are always games left out when I come home,” he admits. And like any house with an interesting personality, it has a few good back-stories. One is the romantic. “We were at an outdoor cafe in Paris about 12 years ago, adn Avi started drawing out the plans for our dream house with a pen on the paper tablecloth. We had no money, so I thought it was a joke. But he did one plan for one lot, another for two lots and a third for three lots, and we still have them all. We are laughing about it, but that plan he drew then is essentially what the house is today,” recalls Karen. One is tense sage. During the first year the couple spent looking at real estate, they passed over the lot they currently occupy, which Lothan deemed perfect because the owners had already torn down a decrepit old farmhouse it held, due to its expensive price tag. But at the end of their second year of searching, right after 9-11, the one lot came up again. This time, “the economy was holding its breath so the price had dropped,” notes Lothan. Yet, he calls it “an act of supreme optimism of supreme foolishness to push that much money into something at a time when one knew what was going to happen.” Bottom line: “we couldn’t have afforded it today,” Lothan points out. And one is pragmatic. The place was easy to design; they knew exactly what they wanted ever since Lothan made those pen-and-ink drawings in Paris. But it was tricky to afford. “We had to really fine tune the program to make it more economical,” admits Lothan. The two-story glass curtain wall to edge the courtyard was replaced with a one-story-high curtain wall system topped with clerestory windows; finishes were scaled down; the lightning system was simplified; the basement remains unfinished; a radiant floor heating was eliminated; and a green roof was put on hold – for now. We’ll get to it,” insists Lothan.